The Lutheran Church—Missouri Synod began work in Liberia in 1978. The LCMS' first project in Liberia was to replace a bridge that was crucial for local farmers and missionaries’ transportation. Later projects included orphanage dormitory construction, agricultural training and production, widow micro-enterprise assistance, handcraft and vocational training, orphan nutrition assistance, assistance for those displaced by war, resettlement assistance for people displaced by civil strife, roof for a clinic and famine relief. Since 1978, the LCMS has supported leadership development for lay preachers by developing curriculum materials for a leadership training program. In 2002, eight courses of the 21-course curriculum were prepared and taught. The first of 24 cluster trainers were trained and returned to their sending clusters in Liberia and Sierra Leone, where they trained an additional 230 lay leaders. Two very large language groups representing more than 835,000 people were reached through this leadership-development program. Though war and civil disturbances continue to make ongoing ministry challenging, leadership training continued in eastern Liberia (which was relatively stable) for selected leaders at the Coordinating Center for Theological Studies near Karloken until July 2003, when civil war erupted again in Liberia. From 2004 until their retirement in 2010, a full-time LCMS missionary couple served in Liberia and Sierra Leone by helping with agricultural training and humanitarian aid projects. 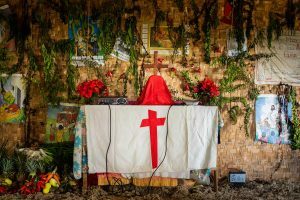 The Evangelical Lutheran Church in Liberia (ELCL) was formed in May 2009 from the merger of four different Lutheran groups, each founded through the Diaspora of the Liberian Civil War through different initiatives of the LCMS. The newly-formed ELCL has 350 congregations, 30 schools and 11,000 members.